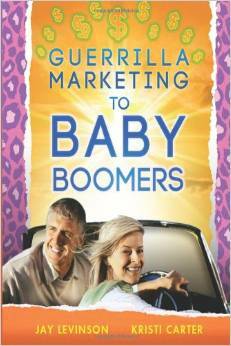 Chapter 2 in my book, ‘Guerrilla Marketing to Baby Boomers’. Once a Boomer, Always a Boomer? The boomers just keep on living and enjoying life. There are two generations of baby boomers, early and late. The early generation of baby boomers, born between 1946 to 1955, are now “empty nesters” with adult children. Their spending priorities have changed from spending money on their children’s upkeep and education to upgrading their homes, clothing, travel and funding their retirement accounts. This group travels the most to see their grandchildren or to have adventures all over the world. The early boomers join country clubs, tennis and golf clubs, gardening clubs and participate in community activities. As an early boomer myself I can attest to those activities. I am always seeking out the best places in the world to travel to and am a tennis club member. These activities require disposable income to fund, which most boomers have available. This is a very good sign for Guerrilla marketers. The early boomers spend a little differently than the late baby boomers who were born between 1955 to 1964. More of their disposable income is still going to their children’s education. When their children start to have families of their own, the late boomers join the ranks of disposable-income spending just as the early boomers. What is happening is a succession of boomers. They are a continued commodity of consumers. Once a boomer, always a boomer continues. You can take the boomer out of the nostalgic decades, but you can’t take the nostalgia out of the boomer. Their mentality is an optimistic, tackle-the- world and live-well attitude. Life is full of so many options for the boomers. Second or third careers have become appealing to the boomers. Online businesses are so prevalent and relatively easy to operate from home that many boomers have multiple businesses, thus multiple streams of income. This succession continues until old age sets in and the boomer is not as mobile. Then the senior boomer can relax and enjoy the residual income that he/she has created in their early boomer years. For now the boomers are enjoying a full and optimistic life. They are spending their money on travel, technology gadgets, exercise, clothes, cars, vacation homes, toys (for grandchildren), pets, gardening, businesses and other hobbies. This is a wide variety of interests and potential marketing campaigns. No matter what business you are marketing to, the campaign, if it’s a good one, will most likely be met with open arms, as well as open wallets. For the next 30 to 40 years baby boomers will be one of the most targeted groups of consumers. Disability rates are falling and boomer Americans are staying healthier longer and later in life. This is a good sign for the “abbies” (aging baby boomers). Healthcare throughout the world is evolving into better, safer and a more affordable way of life extension. For us Guerrillas, the party is just getting started! Thank you for your nice comments. I appreciate you reading this blog and am so glad you received some good information.